The 8 Concert Etudes, Op. 40, were written in 1984 and represent Nikolai Kapustin's compositional style at its broadest and most inventive, a synthesis of the classical piano tradition with jazz idioms. Each study from the Opus 40 Etudes presents the performer with different musical and technical challenges while always remaining naturally pianistic. The etudes tap into a range of musical languages, from ragtime through to cocktail-bar nonchalance, with jazz-infused harmonies and a pervasive rhythmic drive that keeps the music full of energy and excitement, even in the most lyrically expressive passages. No. 1 in C major "Prelude"
No. 2 in A-flat major "Reverie"
No. 3 in E minor "Toccatina"
No. 4 in B major "Remembrance"
No. 5 in D major "Raillery"
No. 6 in B-flat major "Pastorale"
No. 7 in D-flat major "Intermezzo"
No. 8 in F minor "Finale"
Etude no. 3, Toccatina, will be familar to gamers from the soundtrack of Gran Turismo 5 (here played by Shan-Shan Sun). The compositions of Nikolai Kapustin are ideal for introducing audiences to contemporary music, to jazz idioms and to living composers. The exuberance of these concert etudes makes them particularly suitable as encore pieces. Piano asks: How long does the delivery take to Portugal? Sarah Rodgers answered:We send our parcels by airmail and national mail. Normally, it will take up to 2 weeks to reach a destination in Portugal. Hope this helps. Yunji asks: When will I get it? Sarah Rodgers answered:To Korea, it usually takes 2 to 3 weeks by airmail and national mail. 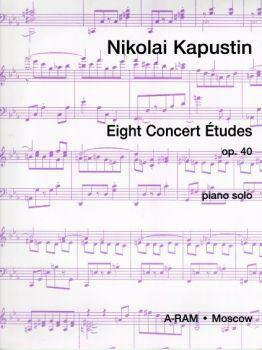 What do you want to know about Kapustin - 8 Concert Études op 40?